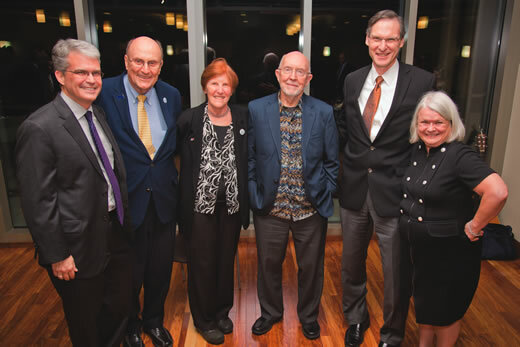 Every living past chair attended the Biostatistics and Bioinformatics 50th anniversary celebration in the fall of 2014. Pictured l-r: Lance Waller, Michael Kutner, Donna J. Brogan, E.C. Hall, Raymond S. Greenberg, and Vicki S. Hertzberg. Lance A. Waller, Professor and Chair of the Department of Biostatistics and Bioinformatics, with a welcome message. When the Department of Biostatistics and Bioinformatics observed its 50th anniversary last fall, the milestone event drew more than 170 people, including all but one of the department's past chairs and its first doctoral graduate. The large number of attendees is a testament to the close, enduring ties that bind the department. This is a department where Rollins Professor and Chair Lance Waller and Senior Associate Paul Weiss are apt to perform popular songs that they have rewritten rife with biostatistical humor. A department where professors give back. Donna Brogan, former professor and chair, endowed an annual lecture created by colleagues in her name when she retired, and Michael Kutner, Rollins professor, former department chair and associate dean, endowed one fund to support outstanding doctoral students and another to honor former graduates of the department. And a department where rarely a week goes by without a festivity celebrating the fact that some student has passed their dissertation proposal, or that someone is having a baby, or that it's Friday. "We are a very collegial department and always have been," says Kutner. "We all work well together, respect each other, and have a lot of fun together." Vicki Herzberg, another former department chair, agrees. "When I think back on my years in the department, what really stands out are the memories of good times—the annual graduation celebration, the annual holiday party, and the mini-golf tournament," she says. "For a bunch of left-brain nerds, we are the most social department in the school." And the most collaborative. Biostatistics and Bioinformatics researchers collaborate extensively with scientists in all of the other Rollins departments, the Emory Schools of Medicine and Nursing, the Winship Cancer Institute, and a seemingly endless list of other organizations, including the Centers for Disease Control and Prevention, the Atlanta Veterans Affairs Medical Center, and the American Cancer Society. The department's beginnings were modest. The Department of Statistics and Biometry was established within Emory University School of Medicine in 1963-1964 with a handful of faculty charged with providing collaborative support to medical researchers. The new department resided in Uppergate House, a former residence of the architect for Emory's Atlanta campus. It was rumored to be haunted. E.C. Hall took the reins from the now deceased Malcolm E. Turner, Jr., to chair the department in 1970. In short order, Hall brought on Kutner and Brogan to strengthen research. "Donna showed up a day earlier than I did, so she selected a plush front office with nice views. I got the much smaller back office with a view of a parking deck," says Kutner. In the late 1980s the department merged with the epidemiology program and came under the leadership of Raymond Greenberg, who would go on to become the inaugural dean of the school. The merged department moved to a floor in the newly completed American Cancer Society building, sharing this space with the Masters of Public Health (MPH) program. Greenberg and Kutner soon teamed with Eugene Gangarosa, director of the MPH program, and Tom Sellers, chair of the Department of Preventive Medicine and Community Health in the medical school, to create "the gang of four" to push for the formation of a school of public health. In 1990, their efforts were realized. Biostatistics and Epidemiology split back into separate departments and became part of the newly formed School of Public Health. "Those were the halcyon days," says Kutner. "The spirit of the day was extremely positive. We had an amazing growth spurt. It was like Camelot revisited." Today, Biostatistics and Bioinformatics has become, in the words of Greenberg, a destination department within a destination university—"a meta-destination." Faculty routinely garner national awards for teaching and research. The biostatistics graduate program has emerged to be among the best in the country, with graduates going to work in government, industry, and academia. "What is remarkable is the wide scope of work that is being done here today, from clinical trials to genetic imaging to bioinformatics," says Greenberg. "This is a very diverse and talented group of people." Waller couldn't agree more. "As long as there are data and questions, our department will play a leading role in research at Rollins, at Emory, and beyond," he says. "I am inspired by all the department has accomplished in the past half century and am excited to see where we will go in the next!"